Why the need for single pane glass repair? In buildings built before 1970, most contractors installed single pane glass. Single pane glass is one piece of glass in a light aluminum frame. Single pane glass repair is cheaper and quicker to repair than double pane glass repair, but single pane glass is less durable, less efficient and easier to break. What is single pane glass repair? If a single pane of glass breaks, we can often custom-cut a new piece of glass on-site, and repair the broken pane. Some single pane window frames also need repair, and we have various options available. There is no manufacturer who continues to make single pane window frames, so sometimes the only option for single pane glass is window replacement. A single pane glass repair is known as a single pane reglaze. Single pane safety glass is required for certain buildings and applications. 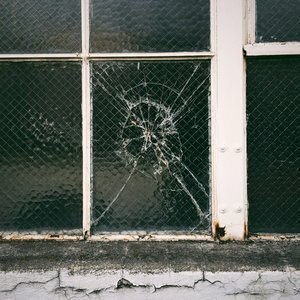 When can my single pane glass be repaired? First, contact us. We’ll schedule a time during business hours, usually within 1 day of your call, to inspect & measure the single pane windows that need repaired and give you a quote. Once you give approval, we’ll measure the window, cut a new piece of glass and repair the broken window. Please note our installation FAQ. A window repair normally takes 1-7 business days for inspecting, measuring and repairing. EMERGENCY 1-business day single pane glass repair is available. You may or not need to be home for window repair. Single pane glass repairs can sometimes be completed from the outside; homes and businesses vary. We’ll work with you gain entry into the residence, and work according to your schedule. We work with lock boxes, tenants, homeowners and property managers frequently and understand how to schedule to meet your unique needs. Where does Lightning Glassworks & Screens repair single pane glass? How does the single pane glass repair process work? Once we schedule a time for measuring and quoting a single pane glass repair we’ll either cut a new piece of glass on-site, seal the window with high strength, water proof silicone, and complete the repair on-site, or schedule a time to come back & complete the repair. If we need to come back to complete the repair, this is usually because the window frame needs extra repair, the glass is too large to be handled on the back of a truck, installation policies were not followed or a time scheduled was too brief. After your single pane glass is fully repaired we clean up any mess (usually minor) and bill you on-site. We accept check, cash or credit card.